Radical Philosophy is a UK-based journal of socialist and feminist philosophy, the first issue of which appeared in January 1972. 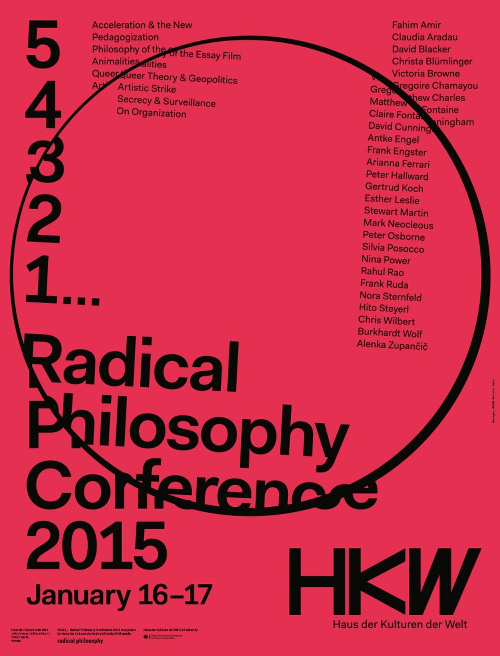 The Radical Philosophy Conference 2015 took place in Germany (Haus der Kulturen der Welt, Berlin) and discussed topics such as Acceleration & the New, Artistic Strike, Secrecy & Surveillance, Queer Theory & Geopolitics, Pedagogization, Philosophy of the Essay-Film, Animalities, On Organisation. Peter Hallward: What is a Political Party?